PABA—which stands for para-aminobenzoic acid—is an active ingredient in many different sunscreens, cosmetics, and other beauty products and, unfortunately, it’s bad for your skin. Use PABA-free sunscreen from Colorescience to shield your skin from the sun’s harmful rays. Why should I avoid PABA? PABA is an amino acid and found in a variety of B-Complex vitamins. It is considered a reflective agent, which is why many companies use it to help absorb harmful UVA and UVB rays. PABA has been linked to liver damage, allergic reactions, and skin abnormalities, so it’s important to look for cosmetics and skin care products that avoid use of this harmful ingredient. What are my PABA-free sunscreen alternatives? 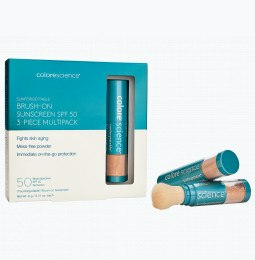 Colorescience offers the perfect solution for people looking for a sunscreen that protects their skin without causing harm. 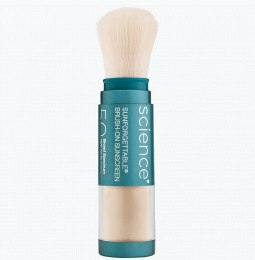 Our PABA-free mineral brush-on sunscreens are easy to apply and reapply. 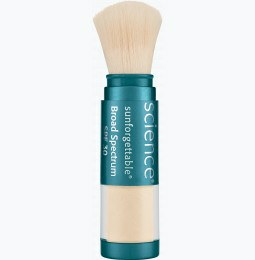 Colorescience Brush-On Sunscreen offers SPF 30 UVA/UVB protection and can be worn alone or over makeup. Can I wear foundation over my PABA-free sunscreen? Yes! Choose from mineral foundation powder and liquid makeup foundation for fuller coverage. Our water-based liquid foundations offer breathability and cut down on natural shine, while our powder offerings are designed to brush on in thin layers. If you need a touchup during the day, simple reapply a coat of our brush-on foundation for a quick makeup overhaul. Does PABA-free sunscreen work for every skin type? Our PABA-free sunscreens and safe mineral powders are crafted to suit a variety of skin types and lifestyles. Whether you’re dealing with dry, cracking skin or looking for products that cut down on oily shine, let our high-quality cosmetics revitalize your beauty routine. With complimentary shipping and returns, you can have confidence in your purchase. © 2019 Colorescience, Inc. All Rights Reserved.